Teachers may find music from their own music library, music store or publisher. WSMA also provides a list of Suggested Repertoire for some events to aid in music selection. 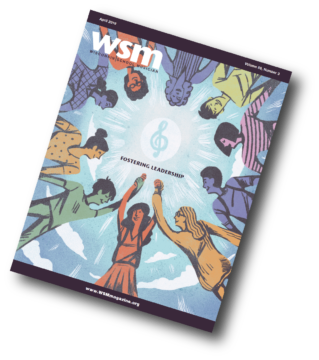 In an effort to encourage students to compose music, every WSMA Festival Music List event allows the option for students to submit their original compositions for performance permission. These submissions are evaluated the same as a published piece of music for consideration. The event being entered is designated “Permission Allowed” or “Permission Required.” This information can be found in the header of the event music list. There will also be a “P” option as a selection number on the list. Original Compositions – Original compositions written by currently enrolled students may be submitted in all WSMA events, including those designated as “No Permission or Transfer.” These events use “SC” as the selection number. Arrangements of pre-existing music will not be accepted. Special Needs – Music may be edited or adapted by the teacher to accommodate a student’s special or exceptional needs that have been verified by school officials through a formal identification process. A full explanation for the editing must be submitted along with the music. The music is appropriate for festival format (pop, jazz, etc. music are only permitted in designated events), reflects the instrumentation/vocal parts designated for the event, and is appropriate difficulty for the requested class. Requests must be submitted by the member school teacher. Parents and students are not eligible to submit a request. NO LATER THAN 6 weeks prior to the festival submit the Permission Request online. Please submit your request far in advance as possible. Approved permission requests will be notified approximately two weeks later via email. If your request is denied, the Permissions Chairperson will contact the director with additional information. Print the Permission Approved email, and attach it to the judge’s copy of the music for the district festival. A field called “Permission Title” will now appear. Enter in the title of the music. Complete the rest of the form as normal.